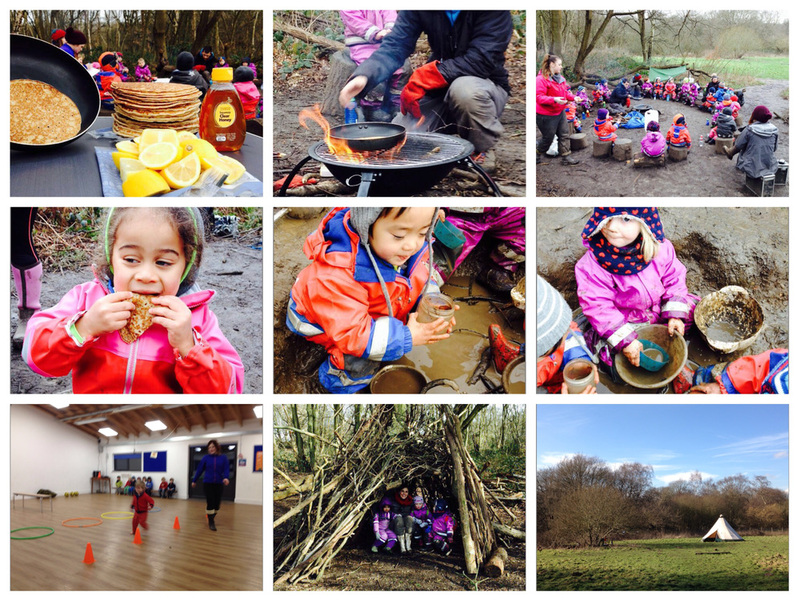 Our week in the forest - LFF children rock! Shrove Tuesday - pancake day! It's been an exciting week in the forest. We had our very first Ofsted inspection this week. It went extremely well and we can't wait for the report to arrive so we can share the grading with you. The inspector was very impressed with our setting and loved watching the children play in the forest. One of the most rewarding moments was when the inspector commented how incredible the children's behaviour was. Now we know and you know exactly how amazing and special all of our children are, but to hear an external validation of what kind, thoughtful, generous, imaginative and social little people we have at Little Forest made our chests puff with pride. LFF children rock! Once again this week we were working with helping the children learn about risk and danger. We once again risk assessed our site but also set up mini hospitals where our poor little dollies were worked on enthusiastically by our little forest doctors who enjoyed finding injuries everywhere and then sticking plasters on. We also had some enthusiastic bandaging which extended from the dolls to the children and into turning Arturo almost into a mummy! This Tuesday was Shrove Tuesday so we took the opportunity to have a bit of fun and had pancakes around the camp fire served with honey and lemon. The children enjoyed the change from marshmallows and quite enjoyed seeing the attempts made to flip the pancakes. We introduced some new maths props to our swamp and mud kitchen and have watched as the children fiercely concentrate on weighing various items in our scales, sort different size objects in sorting trays and pour, fill and empty our measuring cylinders. We've seen some creative use of the wheelbarrows in the swamp where barrows have been transporting large quantities of mud, water and pretend dinosaurs. It's been lovely to watch. 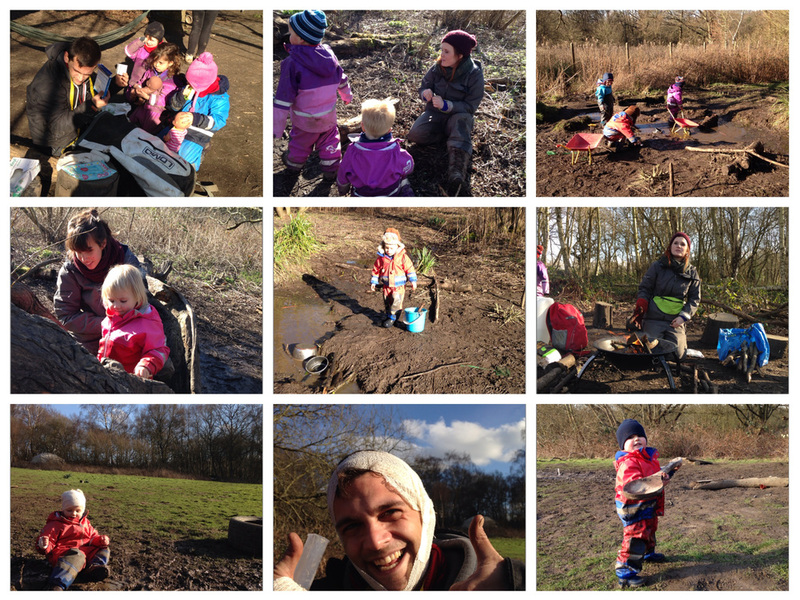 As has seeing children made potions in the mud using a giant spoon bigger than most of our 2 year olds. As usual we've been hugely physically active. We've danced, done aerobic exercises, we've climbed, run and jumped, experimented with balance on the see saw and the swings and have this week been practicing our sniper-like crawls to get to a puddle underneath the climbing tree which has been the home of many an imaginary creature. Finally for our cookery lesson this week the children made an Italian bean stew with sage and cannelloni beans served with buttered thyme and parsley carrots and smashed, roasted potatoes. They followed this with a banana cream pudding - delicious! We've this week trialled afternoon activity classes back at the hall and the children have really enjoyed having a focus activity. On Monday we ran obstacle courses, on Tuesday we learned Spanish, on Wednesday we practiced yoga, on Thursday we had our cooking class and today we are looking forward to some music and dancing. It's lovely to have a way to enjoy an activity class without disrupting our desire for child-led play-based learning in the forest so we look forward to building on these classes to ensure lots more afternoons full of fun. As a reminder half term runs from 15th February to 19th February so we will see our sessional children back again on 22nd February. Thick wool socks or the horrible polyester socks they sell near the checkout at H&M which are super warm! Next week in the forest with the arrival of half term we are going to be learning all about hedgehogs. Our book for the week will be 'It was a cold, dark night' and we look forward to learning all about our nocturnal friends and doing lots of hedgehog crafts. Enjoy your weekend and we look forward to lots more fun next week!